Summer is almost over, but there is still time for one last BBQ, pool party, etc. Of course, if you want to make the get-together even more special, you can take the event into the evening hours. While this can be difficult to pull off, due to the general lack of lighting in most patios and back yards, you can remedy that problem by installing some patio lights. While this sounds like a great idea, it also sounds expensive, right? Luckily you have the option of using solar lights. While more conventional patio lights require that you run electrical chords all over the place, solar lights do not. Most solar lighting fixtures require nothing more than putting them where you want them to go. They collect sunlight during the day and automatically light up your patio once the sun goes down. Another great benefit of solar patio lights is that they use sustainable solar power. This means that once you pay for the fixture, you are done. There is no more worrying about whether you need to put them on a timer to save electricity, or if you should try to hook them up to a switch so that you can leave them off when they are not needed. Solar lights will never add a penny to your energy bill. 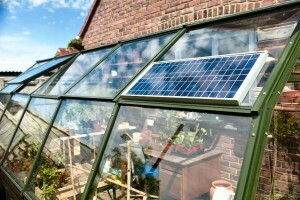 Another great thing about solar lighting is that it is extremely flexible. There are many types of solar powered patio lights for pretty much any application. If nothing else, you can even buy a set of solar garden lights that are mounted on a stake that you just stick in the dirt or lawn around your patio. Even those will do a pretty good job of adding to the light in your back yard – and they can be found for as little as $10. There is no doubt that if you are looking for a fantastic way to light up your patio for those summer evening get-togethers, solar lights will definitely get you there, and they will do so for less money than you would probably think.